Partying holidays: Famed for cheap drinks and heaps of fun – we can guarantee if you’re looking for some great nights out, holidays to Magaluf 2019 won’t let you down. Home comfort holidays: Magaluf holidays have had us Brits flocking to the Spanish shores for years now, and it knows how to cater to its tourists. You won’t find much history or traditional Spanish restaurants here, but then that’s not really what holidays to Magaluf are all about. Beach holidays: The beach on Magaluf holidays has been made even better recently thanks to a £1.5 million renovation of the promenade. Once you’re done with lazing in the sun, you’re only a short stroll away from cafes serving up tasty grub like all-day full English breakfasts and steak and chips. Then you’ll be ready to take on all the action of the nightlife on Magaluf holidays! If you're looking for family Holidays in Majorca then we'd suggest reading our holiday resort guide on Alcudia. 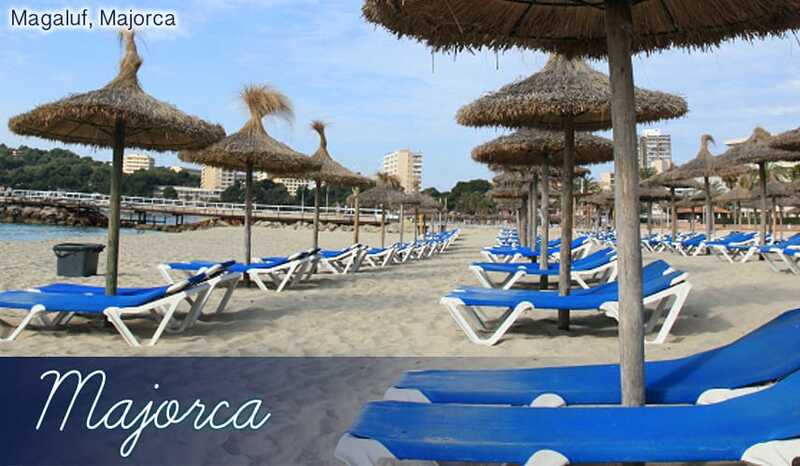 Click "Alcudia Holidays" for specific holiday resort details. Two water parks: If you find yourself getting a little bored of the beach during your holidays in Magaluf, you’ve got a choice of two water parks, Aqualand and Western Park, to keep you occupied. Go shooting down the brightly coloured slides and then have a drink after to recover! Of course, you’ll still be able to enjoy the bright Majorca sunshine as they’re entirely outdoors. Entertainment-focused holidays: Although there are plenty of bars and clubs for dancing and partying, maybe you’d like to have a break from all the nightlife and go to see one of the famed theatre shows during your Magaluf holidays. Come Fly With Me and Pirates both go for all-out entertainment with singing, dancing and acrobatics crammed into amazing all-round performances. You can also have a slap-up meal and a few drinks while you’re there too. Magaluf beach: The main beach on Magaluf holidays has been a star attraction since Magaluf started getting into swing of things in the sixties. Now it’s been made even better by a new promenade that stretches all the way along the coastline. Magaluf beach gets busy in the summer, as people travel from holiday resorts miles around to enjoy the fine sand and calm waters. It’s well stocked with cafes and restaurants so you’re never too far from a burger or a coke if you fancy a break from the sun during your holidays in Magaluf. Cala Vinyes: Although Magaluf beach is so good you never really have to leave, you might think it’s worthwhile to pop down to Cala Vinyes. It’s a soft sandy beach with big palm trees to provide plenty of shade. Cala Falco: The third beach near the resort is a real beauty – surrounded by huge rock faces on both sides and only 6km from the centre of Magaluf. Bar-lined street: We really must mention the excellent nightlife in Magaluf holidays. After all, it’s really what makes Magaluf so attractive to thousands of party people who come here year after year for their holidays. The main strip, Punta Bella, is packed with lively bars and their neon signs lighting up the night. Eastenders bar has a fantastic atmosphere and if you’re up for an all-nighter, many revellers enjoy Revolution and Bananas. One of the best things about the bars here is the many drinks promotions and very low prices on cocktails. Because your drinks won’t break the bank, it makes cheap holidays to Magaluf a real possibility. BCM is the only club in the resort but it’s a good one, with many big-name DJs playing throughout the summer. The local KFC is within staggering distance too – bonus!